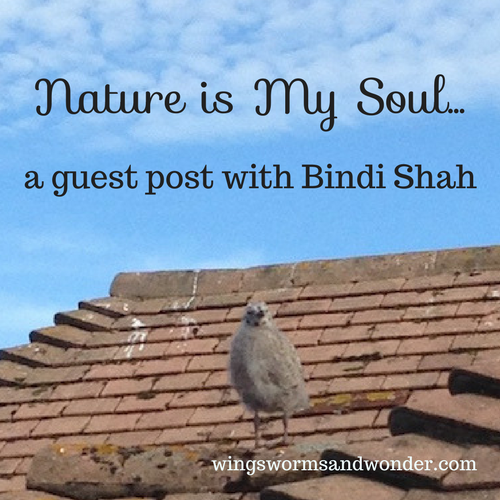 This week we have an inspiring guest post by the amazing Bindi Shah. She is a good friend of mine who brings a wave of much needed peace into the world. A meditation teacher, coach, and all around super person, a few moments with Bindi will lighten your heart and brighten your day. And with all the craziness from weather to politics lately, her presence is much needed and appreciated! I love noticing nature – the sunrise, the flowers, the animals. For me, these are the way my soul speaks to me in this physical world. The birds I see on my morning walk, the flowers I notice in the gardens, the way the sea welcomes me with its waves. All of these signs have meaning for me and are messages from my soul. The soul is the innermost part of you. It is your inner being, your spirit, the part of you which is your truth. It is the inner self you hear in meditation, when you are in silence. 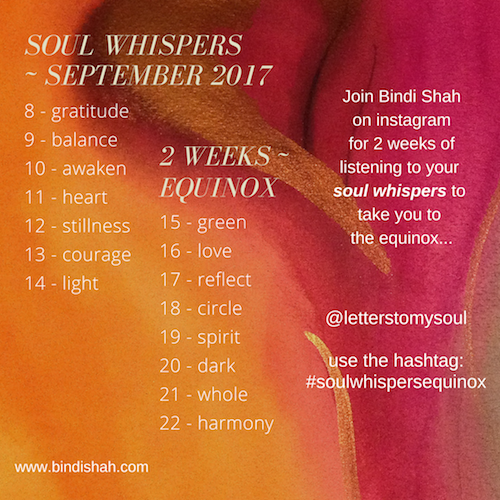 I listen to my soul messages in meditation, but I also listen and observe the way my soul is conversing with me by way of ‘soul whispers’. 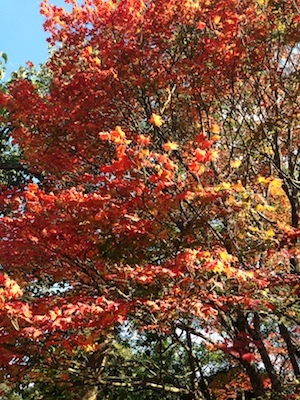 When the leaves start going red, orange and golden in the autumn or start to fall from the trees, my soul is showing me endings. I reflect on what endings are occurring for me at that moment, or perhaps situations in which I am hanging on for longer than is necessary. My soul has shown me that endings are essential for life to grow. 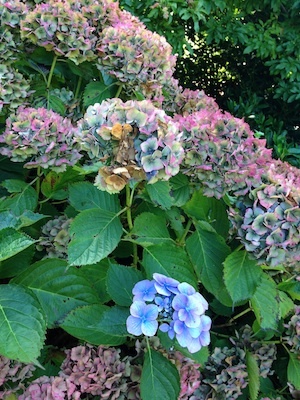 When the petals fade on a hydrangea, my soul is showing me change and transition. Some of the petals are brown, some are still in growth. I am reminded that I have both growth and ending within me at the same time. I am constantly in change and transition, just as nature is. When I see an earthworm, I am made aware of regeneration. The earthworm regenerates our vegetable peelings into soil and also regenerates itself if it needs to. What in my life is in need of regeneration and regrowth? 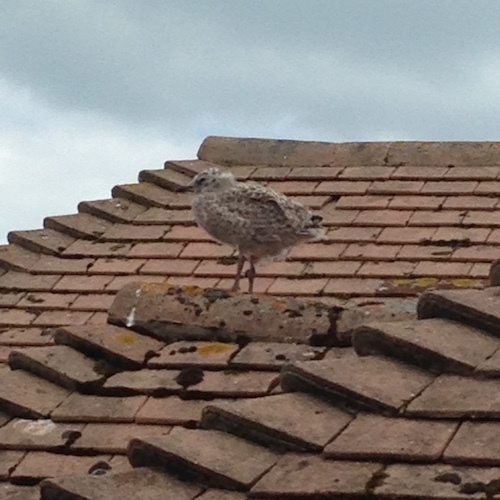 Lately my soul is whispering to me loudly via a baby seagull in the garden. I have been observing her since she hatched on my neighbour’s roof. 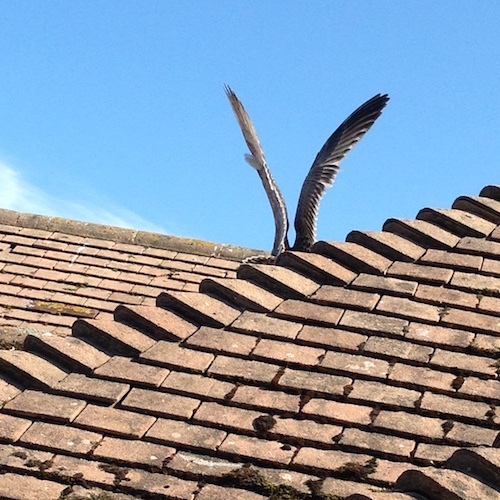 I was in awe at the way she started to walk on the rickety roof. It looked dangerous and challenging to me, but she slowly made her baby steps. A sign to me that we can all progress as long as we start with that first, small, baby step. 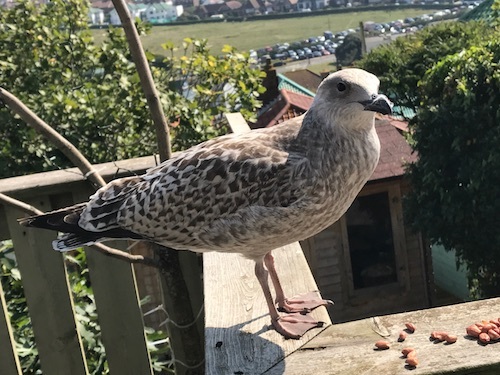 The baby seagull started to stretch and flap her wings a little, she was not yet quite ready for flight, but she was trying out her wings. This reminded me of the ways in which I was stretching my ‘wings’, trying them out so that when I am ready, I can fly high. 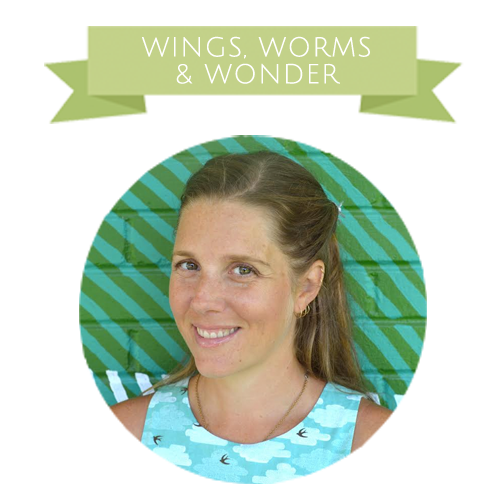 Then she started to fly down from the roof onto our garden decking and her expression was one of wonder… and my soul whispered ‘how do you find wonder in life?’. I am hosting a 2 week challenge over on instagram and would love for you to join me. We will be looking at ways in which our soul is speaking to us via soul whispers. You are welcome to share your nature pictures for the daily prompts and notice fully what your soul is showing you via nature. Click this link for the prompts and details of the challenge! Hello and welcome, dear soul! My name is Bindi. Come meditate, retreat and life-coach with me. I live in beautiful Saltdean by the sea, and taught weekly meditation classes from my home meditation space for 7 years. I now spend my days writing my life-coaching & meditation book. My purpose is empowering people so they can lead happier, more purposeful lives. I am passionate about helping people find their voices and assisting healers and light-workers be the best they can. How do you find wonder in life? so Bindi and I can celebrate with you! Check out Bindi’s website here! Check out Bindi’s Soul Wisdom school for meditation classes here! Giant thanks to everyone for their well wishes on faring the hurricane Irma! Know I put safety first in all my decisions regarding the storm. I am in north Florida and at this time, the track and intensity has shifted well in our favor. South Florida may not be so lucky. I’ll let you know how we fared as soon as I can and thank you for your good vibes!